« Weird and Wacky designs – Total Airheads! ‘The Kiss’ by Gustave Klimt (b.1862 -1918 Vienna) was painted 1907 – 1908, it is probably the Viennese artist’s most famous work. 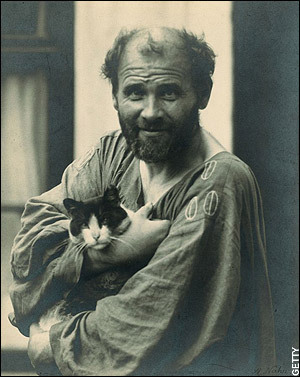 Klimt trained at the school of Applied Arts in Vienna, but eventually broke away from the State’s patronage to form the Secession group with friends. The group believed the promotion of the art of unconventional Austrian painters. This work was part of Klimt’s ‘Golden period’. The Kiss shows the man and woman sharing joy – symbolically dissolving in an embrace. They stand against a background of beautiful decoration, which is flecked with gold leaf. The gold background is not incidental, Klimt’s father was a gold engraver by trade. He had also learned mosaic techniques, fresco and oil painting. This influence is seen in the carpet of flowers. The gold is very like the mosaic found in Byzantine churches: Klimt was very much influenced by Italian mosaics he saw in Ravenna. The couple each wear individual highly decorated gowns. The difference in the gowns is important. The man’s is of a more geometric patters consisting of black and white ‘masculine’ shapes. By contrast, the woman’s is flowery – tieing her visually to the carpet of flowers she kneels on and linking her to ‘mother naure’. Her gown does contain a little of the geometric pattern which unites her and symbolises her unity to the male. A golden envelope envelops them, symbolically uniting the sexes. Klimt’s work explores the themes of birth, life death. The woman is especially depicted by turn as emotional joy bringer, temptress and child bearer. The bodies fused together as one emphasis their unity. Klimt loves hands and uses them expressively in his paintings. Also his use of gold, entwined couples and the sumptuousness of his highly decorated work have a hint of opulent decadence about them proclaiming the end of the century (fin de siecle) a mixture of degeneration and but also hope for the future. 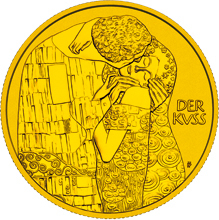 The Kiss was commemorated on a special collectors Austrian coin 2003. 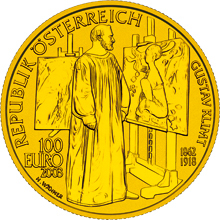 The front of this euro painting coin shows Klimt in his studio. 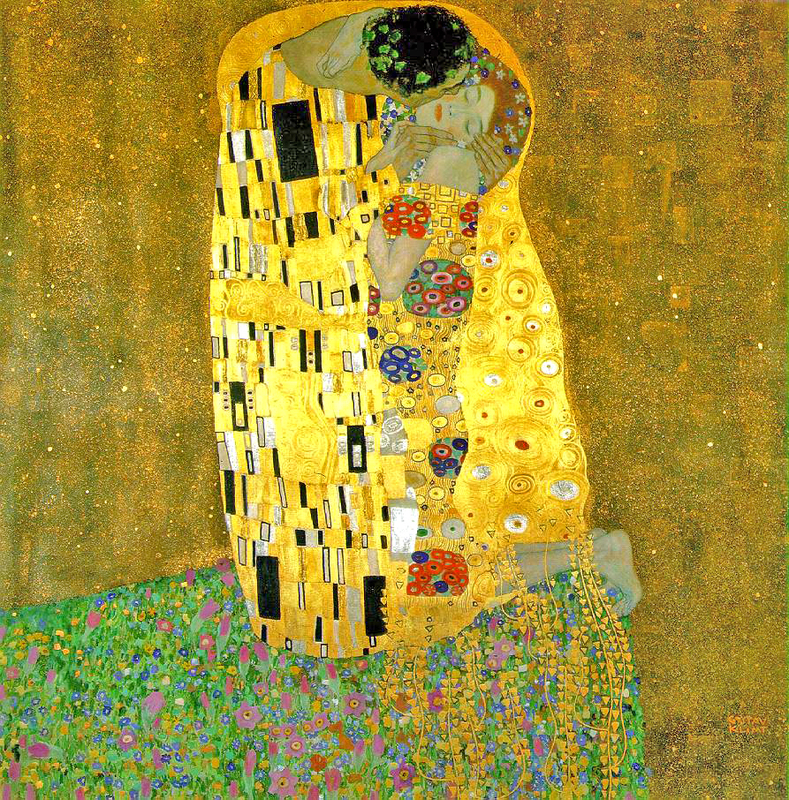 The Kiss was popular in its own time and was purchased by the Austrian State. The Secession group was a warded international recognition because of Klimt’s status as an artist unlike Van Gogh who did not know fame whilst he lived. He is featured in ‘Beneath the paint’ here. 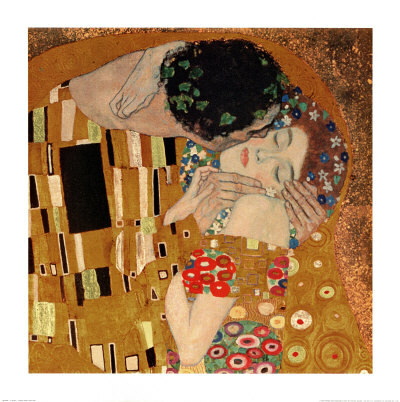 This entry was posted on March 31, 2010 at 12:02 am and is filed under ART, ART HISTORY, BEHIND THE PAINT with tags ART, klimt, mosiac, secession.painting, the kiss, van gogh. You can follow any responses to this entry through the RSS 2.0 feed. You can leave a response, or trackback from your own site. I hold Klimt to be, along with Nietzsche and Freud, the decisive shaper of the fin de siecle paradigm. Much of what we call “our world” nowadays started to emerge with the thought, and consequent work, of these men. I love The Kiss… almost as much as Hayez’s version ;-). I adore the contrast between “loud” and “silent” passion in this painting. Thanks Jadpaloma, I couldn’t agree more about Freud and Nietzsche, the world needed men of thought, to move things on and to give us a better understanding. I like the unity and the ‘seperateness’ of the lovers in The Kiss – each in their own world – yet sharing their moment. Lovely, thanks for your valid comments Jadepaloma – appreciated! Always been a fan of Klimt. Thank you for sharing. I am a visitor to Vienna at this juncture. I love paintings. And I heard lot about Klimt and the Kiss. I must see it before I leave Vienna. Thanks for your blog. Thanks for reading! I hope you enjoy your stay in Vienna and are lucky enough to see Klimts paintings before you leave. Kind regards and safe journey! Thanks for your blog. When I first saw the KISS in the Belvedere, I was totally shocked. There was a slight tremor in my heart. I was just gazing at it and was dissolved with them. Never heard of this artist – I will find out more.